Healthcare industry has one of the highest rates of work-related injuries and illnesses. Healthcare workers face a number of serious safety and health hazards. OSHA law requires employers to provide their employees with safe and healthful workplaces. The OSHA law also prohibits employers from retaliating against employees for exercising their rights under the law. 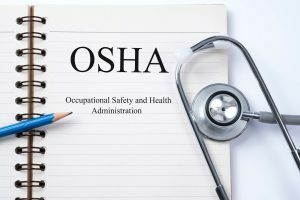 OSHA’s mission is to ensure the protection of workers and prevent work-related injuries, illnesses, and deaths by setting and enforcing standards, and by providing training, outreach, education and assistance. Training requirement is found in the revised Hazard Communication standard (Title 29 Code of Federal Regulations, Part 1910.1200, effective May 25, 2012), which improves the quality and consistency of hazard information in the workplace. This standard states: Employers shall provide employees with effective information and training on hazardous chemicals in their work area at the time of their initial assignment, and whenever a new chemical hazard the employees have not previously been trained about is introduced into their work area. Information and training may be designed to cover categories of hazards (e.g., flammability, carcinogenicity) or specific chemicals. Chemical-specific information must always be available through labels and safety data sheets. EHR 2.0’s certified privacy and security professionals can help your organization comply with the requirement in a most efficient and cost-effective way. Check out our OSHA Compliance for Healthcare Professionals to become compliant today.